Taylor and Abby deRoo’s restored home at 312 E. Central Ave. is the second-oldest remaining home in the city. Advance Newspapers. Seven houses, including the city’s second oldest standing home and a pioneer school, will be on display Saturday for the Zeeland Historical Society home tour. The annual tour will begin at 11 a.m. and features the newly remodeled home at 312 E. Central Ave. Abby deRoo, city marketing director, and her husband, Taylor, bought the home, the second oldest remaining home in Zeeland, in December 2008 and have restored it to its original splendor. The deRoos both grew up in historic homes and made it a priority to find one in Zeeland. The couple bought the house, which was owned by the Viola Den Herder Trust, when it was in the middle of construction from a two-family rental property to a single-family home. "The house wasn’t for sale yet, but we caught wind of the project and got in touch with the owner. We were interested in buying the house and finishing it ourselves. So, that’s what happened," Abby deRoo said. The couple preserved the home’s historic features, such as its original hardwood floors, built-in cabinets, doors, windows, and trim. They added new items, such as apron-front sinks and rustic barn beams, that are in-line with the home’s character. They also turned the porch into a dining room, finished a loft attic, re-sided, added antique shutters, and built a garage. The deRoos moved into the home in May 2009 and say they have received numerous positive comments from residents about their new home. "We have appreciated the community support and figured if people are interested in seeing the outside, they’re probably interested in seeing the inside as well, so it was only natural that we would put it on the tour," deRoo said. 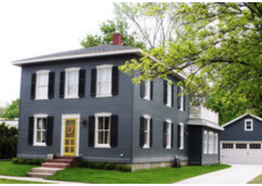 "Also, according to the Zeeland Historical Society records, ours is the second oldest standing house in Zeeland. I think it has some pretty deep roots to this community. We know a little bit about the history, but I am hoping that community members who take the tour might be willing to help fill in the gaps." Johannes De Pree was the home’s original owner, probably building the house with his father Jan De Pree, a carpenter. Johannes De Pree and his new wife, Barentje Brower, moved into the house in 1865. The couple raised their five children in the home. The De Pree family sold the home in 1920. Other historic homes highlighted on the tour include 43 E. Main Ave., owned by the Jason and Marian Cook estate; 117 S. Church St., owned by Ray and Debbie Kirn; 43 E. Central Ave., owned by the Harmon Den Herder estate; 50 E. Central Ave., owned by Jamie and Paula Pratt; 7895 Adams St., owned by David and Clara Brower; and 58 S. State St., owned by Steve and Melissa Boerman. The West Drenthe pioneer school also will be open to visitors. Tourgoers can travel to tour sites in vintage cars and can stop to purchase lunch at the historic Baert Baron mansion, 120 S. Church St. Tickets for the tour are $15 in advance or $20 the day of the tour. Tickets are available at the Zeeland Chamber of Commerce, Bunte’s Pharmacy, and the Dekker Huis/Zeeland Historical Society Museum.